Shipping containers. You’ve seen them on trains, on the back of trucks, at ports and piled onto cargo ships. There more than 20 million of those steel 40 by 8 feet (12 by 2.4 meter) boxes scattered around the world. That’s more than were needed even before the current economic slowdown. Today, as many as one million shipping containers may be sitting around unused. The surplus is especially profound in the United States, northern Europe and China. Given the planet’s excess of shipping containers and shortage of affordable housing it only makes sense that people would make the connection. 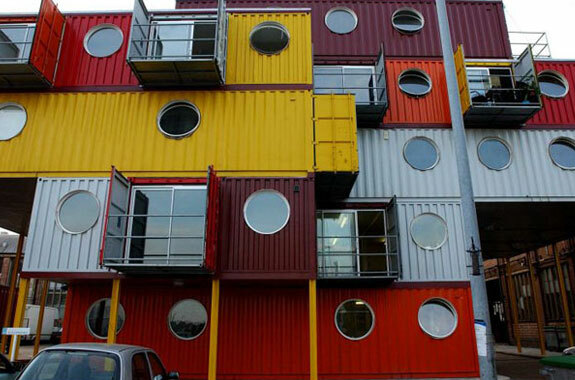 “Container architecture” has become a specialty in itself. The benefits are obvious: Containers are relatively cheap (around US$1,200~1,500 each). They are, by definition, portable. And they are durable (made to survive rough treatment and resist salt corrosion). A container house can be built, on average, 40% faster than a comparably sized traditional house. And then there’s the environmental benefit of putting surplus containers to use instead of letting them slowly rust in a landfill. Keetwonen is the largest complex in the world constructed of shipping containers. Its 1,000 units were initially built in 2005 to provide five year’s worth of temporary student housing. The life expectancy of this complex of buildings has already been pushed back to 2016 and it wouldn’t surprise us to see Keetwonen as a mainstay of Amsterdam housing long after that. 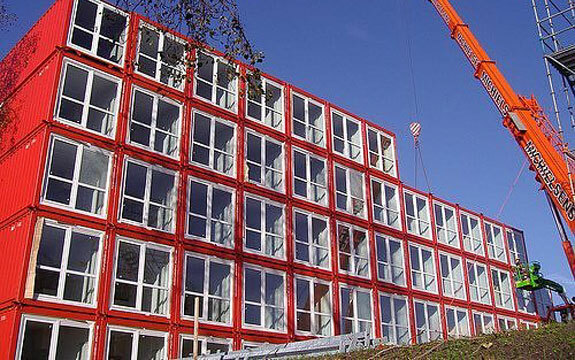 The container units meet all of Amsterdam’s housing regulations and are extremely popular among students—each unit has surprisingly soundproof walls as well as its own bathroom, kitchen and balcony. Keetwonen also “contains” cafes, shops, art studios and even mini-gyms. The Slovenian architectural firm of Jure Kotnik Arhitekt specializes in shipping container construction. Their 2+ Weekend House design uses containers specifically built for housing. This isn’t as environmentally friendly as using surplus shipping containers. But the Jure Kotnik containers have all the electrical wiring and plumbing connections built in, making it possible to construct a 2+ Weekend House extremely quickly. 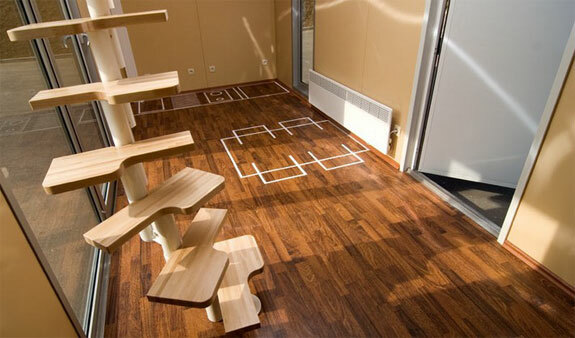 We like the house’s efficient floor plan (see below). But what’s up with the pink polka dots? Container City, by the Trinity Buoy Wharf on the Thames, might be the most famous example of shipping container architecture. We think it’s also one of the coolest. Or, technically, two of the coolest. Container City I has two levels of red containers stacked flush together. Connected to that by a skywalk is Container City II where multi-colored containers, five high in some spots, criss-cross at interesting angles. 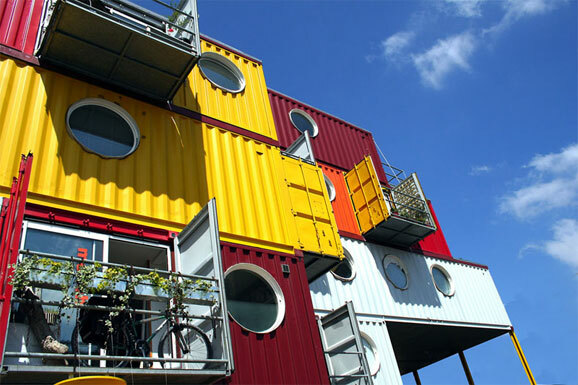 Container City are especially popular with artists who can rent a container home for as little as £250 a month (though the containers in the prime locations and with the best windows go for as much as £1,500). To visit Container City yourself take the tube to Tower Hill Station then the Docklands Light Rail to the East India Station. To the extent there are activists who promote building houses out of shipping containers their goal is for such housing to be truly accessible to the masses and not merely the subject of blogs like Spot Cool Stuff. To that end there are several companies marketing cool, affordable container homes. One of the best is New Zealand’s Port-A-Bach. (Bach is a kiwi word for a small holiday home). Their holiday home product is designed to be self contained (pun?) with walls that fold up. The idea is the these container homes can be transported anywhere with relative ease and be inhabited without any electricity or plumbing hookup. See their website for more details. 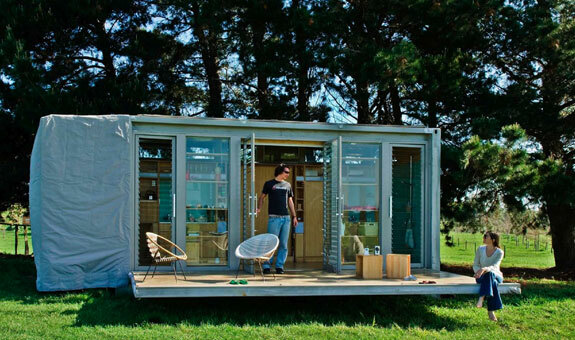 If you are in North America and would like to buy a one-container house check out Ecopods. Their product is similar to Port-A-Bach’s and can be bought for as little as C$26,650 (roughly US$21,500). 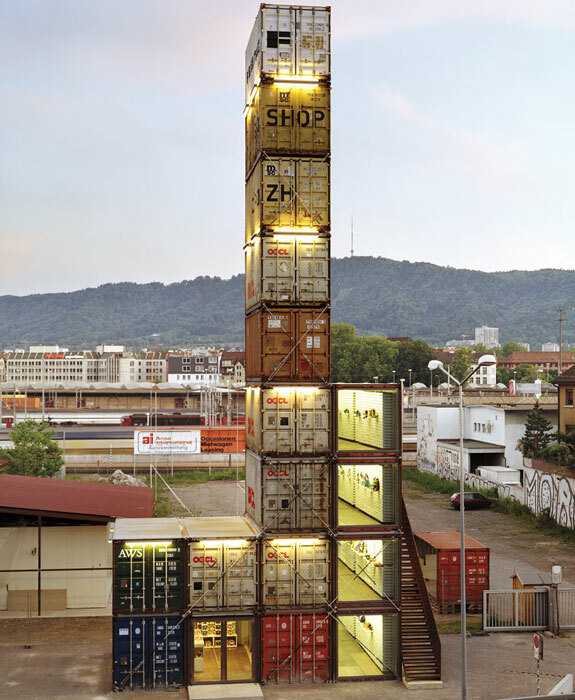 The 26 meter (85 foot) high Freitag Shop is not only the world’s tallest building made of shipping containers, it is the tallest building in Zurich of any sort! The Freitag messenger bag company built this store from 17 used shipping containers to emphasize how their products, too, are made from recycled material. The first four floors of the building are for store display space. The other containers are used for storage and for the staircase that takes visitors to a viewing platform at the very top of the building. Containers homes are a fast, economical and flexible alternative of traditional homes as they provide modern dwellings for any households’ size from individual to family and community housing. Just tell us about your specification and see how we change steel containers in to your beautiful home. We at Giant Container Sales offer you best quality, best space, secure Container House in affordable price. Speechless! 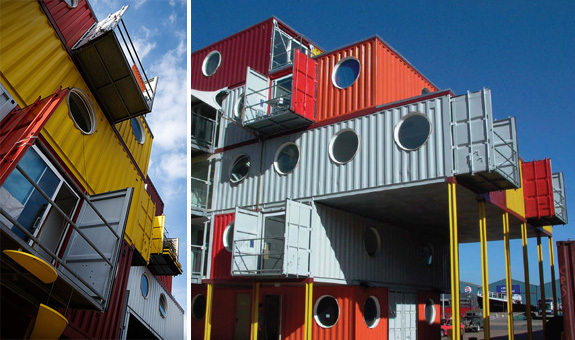 These are really magnificent buildings made out of containers. This can be a good option for those who want to buy a home but with limited budget. Great article, very into shipping container design and homes myself. Good airticle.you are provided beneficial information building houses out of shipping containers their goal is for such housing to be truly accessible to the masses and not merely the subject of blogs like Spot Cool Stuff. We are the manufacturer of the container house! Given all the economic and housing problems, it’s refreshing to see an affordable alternative can be made in such creative fashions. I’d been aware of the efforts to create low-cost housing from shipping containers in vancouver, but these are really something else! Is This container city ? YES! Building with containers is worth taking a look at if you are contemplating a new home. Good resource is the Residential Shipping Container Primer website. A DO IT YOURSELF (DIY) REFERENCE AND FOR CONVERTING RECYCLED INTERMODAL CARGO SHIPPING CONTAINERS INTO BUILDINGS AND ARCHITECTURE. A nice profile of some good container architecture projects, thanks for taking the time to put this together. this is really cool and a really neat idea. I also want to use these to build a home. Where can i get the cheapes ones to do this? Hi, I think anything we can use these old sea cans for is an excellent idea. One question, does anyone know where I can get the engineer certification for these storage containers. The reason I ask is I plan on using one for a storage shed but need to prove to town council it will meet or exceed our Canadian building code for garages and carports. They would like to know how much snowfall and wind it will withstand, …silly I know, after seeing where these are used. Thanks for the link, Few. The Puma store is actually dismantled and rebuilt at all of the stops on the Volvo Ocean Race 2008-2009, and it´s transported to each location (Alicante, Boston, Stockholm) and assembled quickly. The story and photos are here. I hope it is OK to post another link here. My sincere apologies for this if it isn’t. Great posting! Container homes remind me so much of the Farnsworth house in Illinois. Whether fully functional, or in the latter stages of concept, it would be hard to overlook Puma City, the footwear maker’s traveling showroom. Quite simply, one of the better approaches in practice. We actually thought about including Puma City one, but we’ve never seen it, never spoken to some one who has seen it, and at the moment (we might be wrong about this) it doesn’t seem like the Puma City structure is set up anywhere. Clearly, we’ll have to publish a review of 5 more cool container buildings in the not too distance future. Good article, I saw project container house from Redondo Beach, California that is super fantastic and makes containers look like real architecture! Maybe it can be included in next article? Thanks for the comment, Jarma. 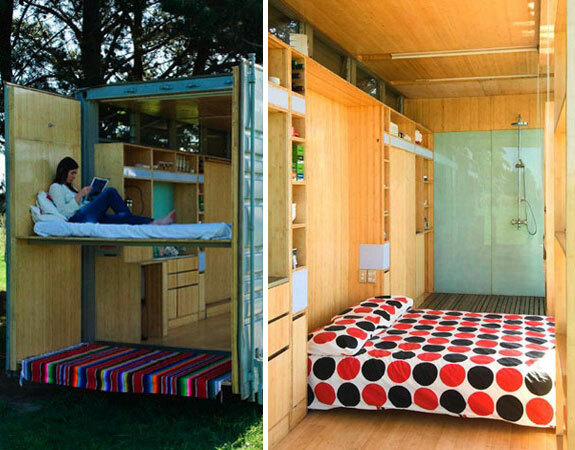 There are certainly enough cool container houses out there that we plan to feature five more sometime in the future.